→Strategy: Why are you in business? Whenever I hit one of those “bad days” in business, I think back to one of many “special days” in my life. One of them happened about 2 years ago. It was just after the first keynote presentation at a convention when a man and his wife, who I had never met before, came up and asked if they could give me a hug. A somewhat unusual introduction, but, hey, I can always use a good hug. When we broke our hug, I noticed that both of them had tears in their eyes. When they recovered he started to talk. That yesterday was his last day in his $120,000 a year, 85-hour per week “dream job” that had been sucking the life out of him for the last 5 years. And that he was able to quit because he had been executing just one strategy I had taught him 6 months before, a strategy that was making him more in his “spare time” than he was getting from that $120K job. Now, his wife shared with me, he could stay at home, spend more time with she and their 3 young boys, and literally have a new life! That conversation made my day! But the day got even better. Just after lunch almost the same thing happened with a different couple. This time the job was $106,000, but the rest of the story was essentially the same. To help normal people gain freedom! Freedom from having to rely on others. Freedom to focus on other much more important priorities than having enough money to pay the rent and electric bill – like family, relationships and service. Freedom for both you and me to have the time, money and capability to literally change the world! Being able to consistently move towards a powerful “why” in your business life is key to success and momentum, especially when business is tough. How are you doing to achieve that why? What do you need to do differently to make it happen? What’s your action plan to make that change? Write it down. Break it down into specific achievable steps, then take action! 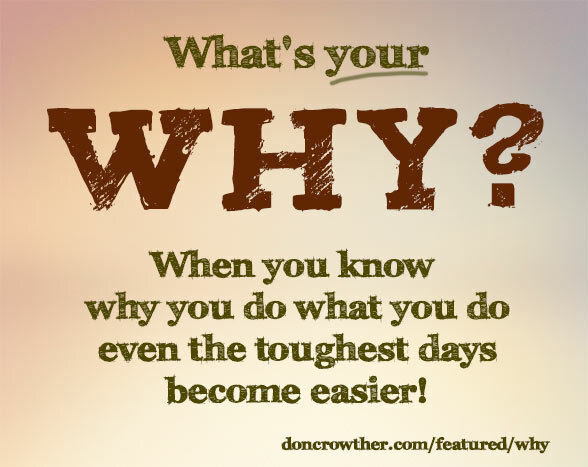 What’s your why? Share it by leaving a comment below, and don’t forget to Share, Like, +1, Tweet, Tumble and Pin this post!